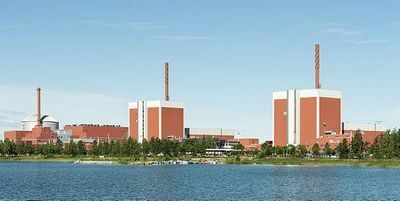 The Olkiluoto Nuclear Power Plant is on Olkiluoto Island, which is on the shore of the Gulf of Bothnia in the municipality of Eurajoki in western Finland. It is one of Finland's two nuclear power plants, the other being the two-unit VVER Loviisa Nuclear Power Plant. The plant is owned and operated by Teollisuuden Voima , a subsidiary of Pohjolan Voima. The Olkiluoto plant consists of two Boiling Water Reactors producing 880 MW and 890 MW of electricity. A third reactor, Unit 3, is expected to be online in January 2020.